Do your gutters get blocked with leaves and other gunk? The Hedgehog gutter brush stops all that! It deflects things away from the gutter which means you don't have to spend hours up a ladder clearing the sludgey leaves out. • Homeowners can save on average £100.00 per year against the cost of professional gutter clearance with Hedgehog. • Hedgehog can save the average householder 30 hours per annum against manually clearing their gutters and drains. 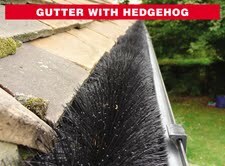 • In most cases, the cost of fitting Hedgehog Gutter Brush to homeowner’s gutters and drains is less than the average cost paid per annum to have them professionally cleaned. • Hedgehog can pay for itself in the first year of installation.